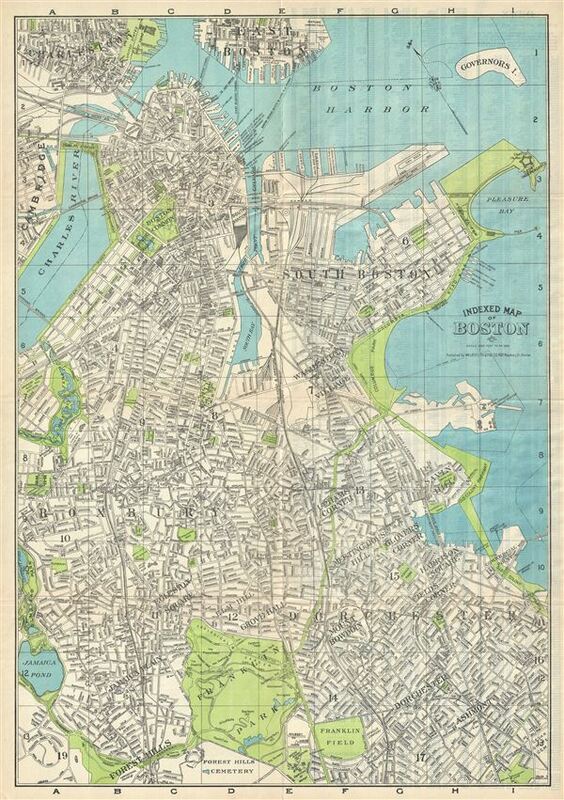 This is a beautiful c.1925 map or plan of the city of Boston, Massachusetts and its surroundings, by the Walker Lith. and Pub. Co. It covers the city and suburbs of Boston from Forest Hills and Franklin Field north to Charleston and East Boston and from Jamaica Pond east as far as Fort Independence and Castle Island. The map is extremely detailed and notes individual streets, neighborhood, parks, ponds, bridges, buildings, lakes, cemeteries, roads, railways, islands, rivers and a host of additional topographical features. This map was Published by the Walker Lith. and Pub. Co., Boston. Very good. Minor wear along original fold lines, including minor holes and rips at fold intersections.